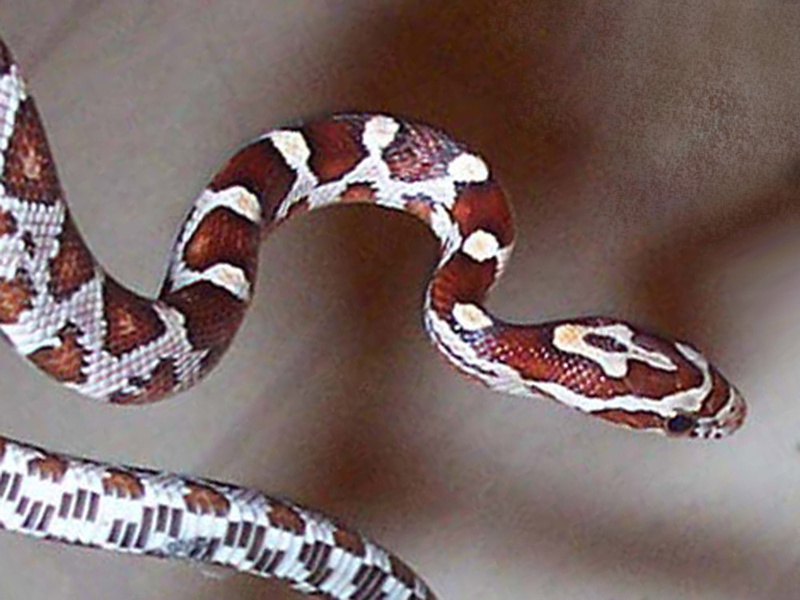 DESCRIPTION: I like the guitar shaped marking on this snake's head. The young are more rust colored and white. Juvenile Red Rat Snake - There are several different ways to almost eliminate your chances of being bitten by a snake. You just have to have some basic knowledge of your area’s common snakes and take a few precautions. Snakes are camouflaged to blend into their natural surroundings. They have naturally evolved to adapt to their particular habitat and use their camouflage to hide from predators as well as catch their prey more effectively. Because of these adaptations, it can be difficult to see them as you are walking or moving around outdoors. If you are worried about them hiding around your home clear anything they will be able to hide under. This includes different structures like sheds or play houses, stray boards, and firewood. If you see a snake in your garden and you know it is not venomous, take advantage of it and leave it there. The snake will scare away or eat pests trying to get to your plants. If you are hiking or camping, make sure you look before reaching into any hole, crevasse, or other place you cannot naturally see into. While being bitten is not likely, if you accidentally grab a snake or pick it up it can happen. If you are out on the trails, wear sturdy shoes, socks and long pants. Do not step over logs, but walk around them as some snakes use those spaces to hunt. If you are out at night and away from the campfire use a flashlight to see the ground in front of you. Protect your pets from unintentional interaction with snakes. Keep your cat indoors and your dog on a leash when he is outside. If your dog gets curious and starts sniffing a snake or your cat thinks it is a toy, they may be bitten. Neither dogs and cats, or snakes can control their reactions.